These essay prizes are awarded every year to the best delegate entry at the annual workshop. In 2014 the prize was presented to Sue Bowles of Acorn Villages, an innovative and progressive organisation for people with intellectual difficulties near Manningtree in Essex, where the principles of nidotherapy are well established. Sue wrote about the sensitive management given to a resident who was extremely difficult to engage. 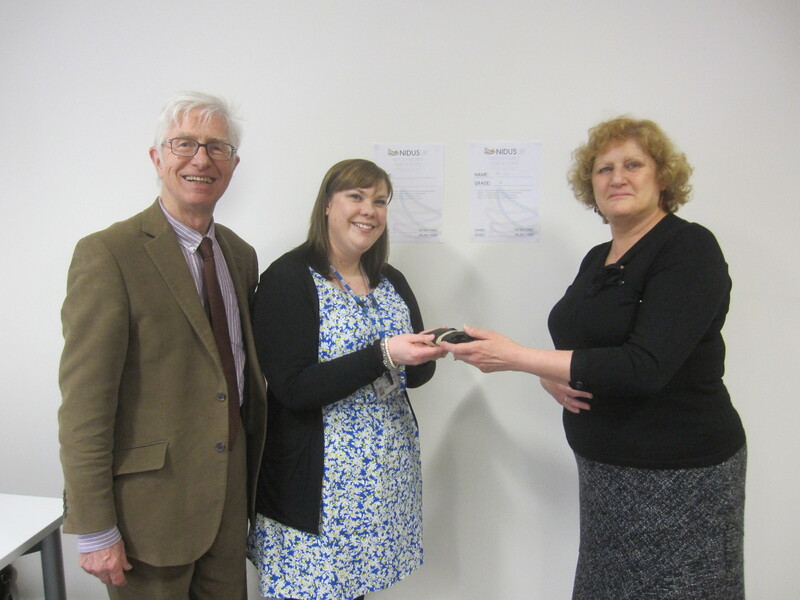 In 2015 the Essay Prize was presented to Emma Donaldson, a Clinical Studies Officer working with Berkshire Haelthcare NHS Trust on 19th March 2015 by Sue Bowles, at the Royal College of Psychiatrists in London (see photograph below). Emma wrote well about the essential characteristics of nidotherapy that make it distinctive. The 2016 Essay Prize was given jointly to Alan Belton, a clinical manager of an assertive outreach team in Essex, and to Pascale Rolle-de Leeuw, who combines work as a criminologist and clinical psychologist in forensic departments in the Netherlands. Alan answered a question about the nidotherapeutic management of potential aggression occurring in a pub, and Pascale responded firmly and well to the frequent comment that nidotherapy is what all mental health professional do all the time.